They lured customers by promising weight loss with no drugs. They promised drug-free help with hypnotism, but the sessions were really a clever ruse to sell weight loss supplements like TrimSpa and LipoSpa. Enough customers complained that New Jersey sued them. In the settlement, TrimSpa refuses to accept any liability or admit to doing anything wrong. They promise to inform their customers better next time. They shelled out the customer retribution plus and additional $750,000 in exchange for not having their name sullied by a loss in the courts. Remember, no matter what they promise you, there are companies out there trying to take your money. Don’t let them. You can lose weight on your own without drugs or patches or formulas or supplements. I have a collection of exercise bands in my basement. They are so light and small that they have survived several purges of the basement. They don’t take up much space, so they haven’t gone to Good Will like the Bosu Ball did. She is also holding dumbells in some of these pictures, but it is very clear how to place the resistance band in order to get the workout you need. If you’re a power user, then you might need dumbells in addition to the bands, but for a lot of us, just getting started is the hard part. Ask Laura: Core or Flex? How do you decide which to do? Flex Points or Core Plan? For me, it was a really easy decision. I was starved as a child, so any diet that restricts which foods I can eat, immediately throws me into Starvation Mode. If I can’t work a treat into my diet, then I might as well not diet because I will only be able to stay away from the restricted food for so long before I end up bingeing. Of course, when I first started Weight Watchers, they didn’t have the Core Plan, so I really didn’t have a choice when I was learning good habits. Fortunately, that was really good for me and my history with food. I used to save up my points for those treats that used to be restricted on other diets. Now, however, I might as well eat on the Core Plan. I follow the nutrition advice so closely that switching over to the Core Plan would not be an issue for me. There is that psychological issue, however, where I am scared that I might switch over into Starvation Mode if I realized that food was restricted for me. Even though I eat Core Foods ninety percent of the time, I don’t think I could ever follow the Core Plan. Don’t let yourself get taken. Best case scenario, they steal your money. Worst case scenario, they damage your health and go out of business before you can sue them. The bad news is: there is no magic food, pill, patch or excercise machine. The good new is: all you need to lose weight is within you. You can do it on your own without them. In June 2004, I did a review of a program called i2Workout. It was a program that can make what’s like an iFit CD that will control your treadmill (or elliptical trainer or exercise bike). I used it quite regularly on my old treadmill, running it directly from the computer. It controlled the speed and incline of my treadmill and I was able to create a workout without pushing the buttons a million times. This program was created by Mike Curiale. He seemed like a genial fellow in the few emails that we exchanged. Unfortunately, he has dropped off the face of the earth. My emails to him have gone unanswered and eventually, they started bouncing because the mailbox was full. You’ll notice on his website that he has removed his program from his website, so it is impossible to download it anymore. I have received some emails from people who read my review, wondering if I would be able to give them a copy. Make sure you read Mike’s website so you can install it correctly. I haven’t tried the program that WinSite has available, but if it’s anything like the version I have, it will be easy to use and very helpful. I have heard the idea that food addiction is similar to drug or alcohol addiction. These researchers are measuring brain activity and the reactions of it in relation to addiction. It looks like addiction causes the same activity in the brain, whether it’s for food or drugs. “This is consistent with the idea that cravings of all kinds,â€ (whether for food, drugs, or designer shoes) “have common mechanisms,” says Pelchat. The only problem with this is that I can’t quit food cold turkey. I’m well-aware of the fact that I use food like an addictive substance, but I can’t stop eating. Worse still, I don’t believe in a god, so those twelve-step programs are useless on me. I’m not turning my addiction over to an imaginary friend. All that I’m left with is consciously dealing with the things that lead me to overeat. Dealing with the problems and the emotions that make me want to turn to food has been the only way I have been able to stave off the bingeing. If you find you have this problem, try reading Losing Motivation. This is how I deal with the times when I feel like bingeing. Via: Mind Hacks – Addicted to food? There is a scene in Back To The Future II where Michael J. Fox falls into water. His futuristic clothing makes itself dry with a rush of air. The University of Bath is trying to make clothing that dries itself out. 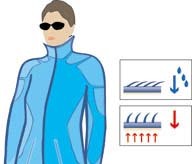 It will use a reaction to humidity (from sweat) to open its tiny fibers, allowing more air into the garment. It sounds really cool and when it comes into existence, I’m sure that all the running magazines will tell you that you can’t go for a run without it. Just remember that people lose weight running in cotton shirts and Payless Shoe Source tennis shoes all the time. All it takes is dedication and moderation. I think the reason that Weight Watchers worked so well for me is because I approached it so slowly. I didn’t dive into it like I usually did with most diets. My sister lost 25 pounds on Weight Watchers and she told me that as long as I stayed within my points, I would lose weight. I believed her and I didn’t pay much attention to the eight good health guidelines. Guess what? I lost weight. As long as I kept my points within my range and was honest about what I ate as far as portion sizes, I lost weight. As I continued with the program, I slowly added the good health guidelines to my diet. I never suffered from “Fiber Overload” or stressed too much about “Getting My Water In.” I just slowly adopted all the recommendations given to me instead of jumping in and making all those changes at once. I think that’s why I was able to make the change. Whenever I tried other diets, I jumped in full steam ahead. It was so difficult to make all the changes that needed to be made that I usually gave up within a couple of weeks. So, what does this mean to you? The FTC is working diligently to protect you from fraudulent weight-loss claims, but these companies are breeding faster than they can cut them down. The Fulfillment Solutions Advantage, Inc. There is no magic pill, food, patch, or exercise machine that can make you thin unless you make changes to your diet and exercise levels. If you are going to make changes to your diet and exercise, do it by yourself and don’t waste your money on products that haven’t been proven. At best, they steal your money and leave you fat. At worst, they injure your health or kill you. Wouldn’t the world be a better place if we truly appreciated the lovely food that it has to offer us? 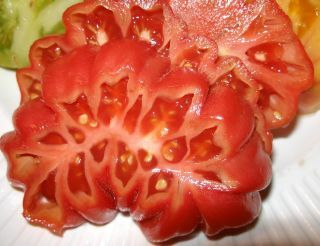 Why haven’t I written a poem to a tomato? There were many times when I was starving in Billings, when a plain boiled potato tasted like sweet sustenance. Once, I was so hungry, I ate a huge zucchini the size of a small watermelon. It was probably a total of 100 calories, but I was stuffed and full when I was done. Why didn’t I ever write a poem to that monster of a zucchini?